"User has to setup the port used to read the hall sensor, <...>"
Hallo! Nice job, i like your work on those bldc's with atmega8. In your two projects, witch one had the most torque on the motor: the sensored or the sensorless one? I'm interested in making a diy rc hovercraft from scraps and junked pc components for a charity purpose. Thank you! i've not measured torque force, for shure the sensored has more force on startup stage, cause input are driven by hall sensor. No problem, just google for "Eclipse AVR tutorial" you will find some website that teach you how to build and hex file for ATmega with Eclipse. I suggest you, at first, to try building and loading a simple project, like a blinking led, then try with this one. I saw the schematic and the source code for sensorless. When I check the source code and the schematic, I found some difference. To change the direction, you use the PC5 port. 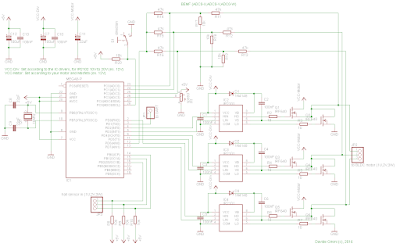 But the PC5 connect to on the PD0 schematic. So I'm confusing. I want to know what the truth is. And I want to get the schematic of the latest version. Can you send it to me? Thank you for feedback, I've never noticed i've posted the wrong schematics version. The one you can find now in this post has correct wiring. Your source code is simple and excellent. So I can understand the concept for the BLDC. Also I can know how to implement it. As your code, for the change a speed and a direction, first stop a motor then start it. Is right? I think that the speed is changed while spin. So I just add some part as follow. is it possible? The sensorless version of my code check the backemf by ADC continously (BLDCSENSORLESS_ADCREADSEL), ADC is always "busy". that's the reason why i prefer to read speed changes while not spinning. You could free the RX pin an control the speed by uart. You also could use other tecnique to read the backemf. Some time ago I was implementing a version that use cumulative current check, and make less use of ADC, but I've never continue on that project. I suggest you to give a try to the Takao code from rcgroups.com, or the wii-esc project code. BLDCSENSORLESS_ZCERRORS it is used to check how many zc incorrect position (errors), occours, if too many occours, then a startup loop is launched. Unit for speed, is 0 to 100. Check your hardware with another firmware, like wii-esc, so you will be shure that hardware is ok, and then you can debug the firmware. how do i define zc threshold ? i mean if it is estimated tobe 4 volts >>how do i write 4 volts in ur code"i see value of 150 and i dont know what it refers to "volts - millivolts....??? My threshold is a raw value, not a voltage converted value. if ((!bldcsensorless_zcpolarity && currentbemf>BLDCSENSORLESS_ZCTHRESHOLD) || (bldcsensorless_zcpolarity && currentbemf>>>>????? That's where the zero crossings (zc) is checked. Keep in mind that i use adc to check this, a better approach should use the analog comparator. 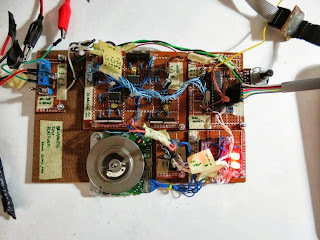 As soon as i will have time to implement that, i will release an analog comparator version of this project. which wii-esc is suitable for ur hardware scheme? Check the wii-esc circuit, i suppose you just have to change ports setup. 2 i flashed the mcu with ur code"didnt change it coz i dont know what variables to change regarding zcthreshold and the port used to read bemf current "
Again, check the harware whit another firmware, then you can debug the software. Mine is a farily basic driver, It does not implement duty cycle, and do not use analog comparator. So if you need performance, i suggest you to switch to another one. Takao Shimizu on rcgroups.com is building a simple but very good driver, check the "BLDC controller" discussion on the rcgroups.com. To read more about bldcmotors, rcgroups.com is the place you have to be. 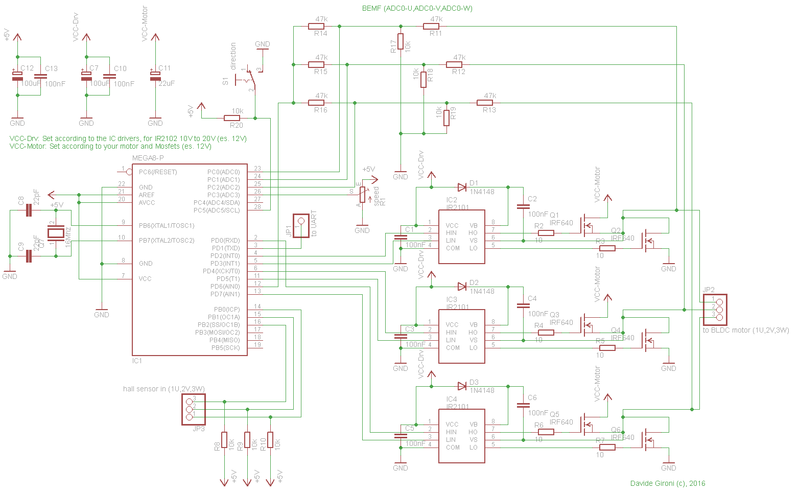 Also a good starting point will be the AVR444 Atmel Application Note. It could be because you are trying to move it too fast. If you are using this driver keep in mind that this is not a PWM driver. Also it use ADC reading to read back EMF, there are faster approach that use ADC comparator, and faster ADC conversion means faster spin. To adjust the speed, I understand you can bypass the switches (in order to avoid the losses), and instead do it by adjusting the VBus going to the motor. The switches would only be used for commutation. But what if you want to control speed via the PWM duty cycle.. does it matter which switch you pulse (i.e. high side, low side, both (complimentary))? Also, there's unipolar vs bipolar (1-4 quadrants) that I'm not sure how what this means in practical terms. From what I've read, when doing unipolar, the rotation direction is determined by the commutation sequence, but in bipolar, the direction is based on if the duty cycle is less than or greater than 50%?! But how (or why) does this actually work? Also, can you recommend where to buy a driver board? I'm not too handy with a soldering iron, but would love to hook up a bldc motor (no sensors) to my atmega1280 kit. I'd like to try 6-step trapezoidal commutation and maybe someday sinusoidal/foc with a beefier processor! If you mean controlling the speed control of the driver by PWM, you need to implement a PWM reader using the interrupt input PIN as example. There are a few post on avrfreaks to discuss about this. For the "how to drive", and "how it works", The unipolar / bipolar commutation sequence it is a PWM techinique of controlling the motor. This (my driver), is not PWM. The cheapest compete boards that comes to me, are ESC 30A drivers commonly used for RC. You can buy any SimonK compatible ESC board, then open it, make just some solder to expose the ISP programming wiring, and use the internal ATmega8 micro. Or you can buy somthing like the hip4086 and use just some mosfet to build an external driver to use with your ATmega1280. Awesome, thanks! I was thinking you were using pwm because the bldcsensorless.c source had a comment about fast pwm mode... but looks like that's just to setup the timer. So are you controlling the speed by adjusting the time (ICR1) between when a zero crossing occurs and when the next commutation is applied? Yep. The speed control it's "ICR1 = bldcsensorless_speed;". I'm working on a PWM driver, but In this period I'm full of work and I do not have time to finish that driver. Hi Davide . I made it but what is the UART (PD1) ? where i should connect it to ? What is the use of it ? the uart PD1 is just for debug purpose on serial port. If you need to debug something throght serial connection. I made both in real and also in Proteus . In real it rotates the motor for a while with different speeds and again and again. and it has nothing to do with the speed variable resistor and direction set . Check your timer setup. Check the zc bemf threshold. Scope around to see what's not working. It will probabily do the startup cycle, then maybe the zc threshold is not read or it is not propery setted. It changes by motors and even by power driver. You have to debug it. But I can't understand why PD6 don't have LPF? I had known neutral point need LPF. Its input is HF signal. Hello. The schematics you see above it's a standard implementation. The code in this library does not use the comparator on PD6. A better approach is to use that comparator. Indeed I've another driver in production which use that comparator. I will share that project soon. It can't start with itself. If I forced to start, it has run. I think starting power is lack, but I can't modify. How can I fix the source to do? I modified i and delay_us(5), but that wasn't change. Linked address is video of my bldc driver. I modified zc threshold and zc error but it can't run too. Hello, at first i would try with another motor, one that's needs less current then the the one you are using, maybe a floppy or cd one. Just to see if is all working. But remember, this a simple brushless driver, i think you should go for a PWM one, which works slighty better on high speed. Hello, you can download the code for this project by the link on the description. However, this code does not implement SPWM. Hello, you can find it in the blog post link. thank you so much, nice. is this all code able to generate with CVAVR software.? it's ok, i'll try to generate with CVAVR because I usually use it. Davide, could you send me hex file of sensored and sensorless to my email ruslirizani@gmail.com, please. Ciao Davide, spero che non dia fastidio che scrivo in italiano ma lo é per me molto piú semplice. Ho un BLDC motore coi parametri tecnici 100V/150Hz 280W 2250r/min ed ho provavo far girare questo motore per mezzo dello tuo driver. Sono riuscito a farlo girare coi 15V sugli MOSFET senza qualsiasi modifiche dello programma, anche se il motore si è avviato molto difficilmente e qualche volta ci voleva pure 30 secondi finche non si è avviato e quando si girava, lo faceva molto lentamente e percio mi sono deciso di provarlo coi 50V sugli MOSFET ma dopo aver provavo questo, mi scoppiarono qualche componenti dello driver e non so perché. Potresti darmi qualche consiglio come dovrei modificare lo programma (BLDCSENSORLESS_STARTUPDELAYS , BLDCSENSORLESS_STARTUPCOMMUTATIONS, zc threshold) o componenti dello schematics? In effetti, é secondo te possibile gestire il mio motore per mezzo dello tuo driver coi 50 o 100V sugli MOSFET? Ciao, questo driver non implementa alcuno schema di PWM. Questo significa che durante un ciclo di commutazione i mosfet sono sempre ON o OFF (al contrario per esempio di uno schema come H ON L PWM per bldc). In realtà anche quella usata da questo driver è una modalità di PWM, ma non funziona bene soprattutto a bassi giri. Il mio consiglio è dare una occhiata a driver più performanti come SimonK o anche wii-esc. Sto terminando un driver che implementa PWM però non riesco mai a trovare il tempo di finirlo, quindi per ora è ancora in prova. Puoi tentare modificando STARTUPDELAYS, STARTUPCOMMUTATIONS, STARTUPDELAYMULT (per problemi nella fase di inizio corsa), TIMER1_ICR1 TIMER1_PRESCALER (timer principale del ciclo di gestione) SPEEDMIN ,SPEEDMAX (indici per velocità min e max del motore) ZCERRORS soglia di ZC (questo è un parametro che può variare da motore a motore). Tieni sempre d'occhio il consumo di corrente, ed il calore dissipato dai mosfet. Spero di esserti stato di aiuto. Un saluto. Nota: il tuo italiano molto buono non ti preoccupare. Hello Sir I am trying to make this project using STGIPN3H60 IC but it uses different technique to measure current and voltage , So what will be the changes in code and schematic. Hello, you can try to add the BEMF part of the schematics you found in this page (R17, R18, R19, R11, R12, R13) out of the STGIPN3H60 W,V,W output. It should work. I downloaded the files and trying to compile with atmel studio 7. But unfortunately I can not do it. Can you give me a hand How to do it ? About the Atmel Studio, Check that you have linked all the needed libraries. Take a look at the compiler output and try to debug it starting by the compiler output errors. But don't copy and paste here the full compiler stack error please, I'm think long comments became useless cause people tend to ignore long readings. and, there are another errors, which I believe due to this error. Thanks for your time Again. By the way thanks for the quick mail my friend. Hello, you are missing to include the adc library in the correct folder. you have to check the folder structure and the inclusion of folders. I am trying to make project about control system of angular velocity reaction wheel BLDC motor with close loop method. i am using ATmega8 and AVR studio 4 as programming app. Do you have source code of my problem? Hello, unluckly not, or I should say. You can take inspiration to project like wii-esc or Takao code from rcgroups.com. My driver here is a closed loop one. The main disadvantages of this driver is that PWM is not fully implemented, and I did not use the ADC comparator for bemf detection. I have a new driver I'm tring to develop from months, but due to other project that one is still on my benchtop. I hope I will finish that driver soon. I fell in love with your controller, I want to build it! Can you send me the HEX files / There is sensor driver and sensorless driver HEX files Thank you in advance for your time and consideration. Hello and thank you. You've got mail. As a side note, I'm developing and enhanced version of this controller, but It's not yet completed, I hope to post it soon. Davide Gironi, I need the Hex file of the following project of you "avr_lib_bldcsensorless_01c.zip". Plz provide me the Hex file with the folder. Hello, you have to include the adc library, mine or other one in order to make this project work. I can give you the hex, but it will be useless to me, cause you will need to compile it out and modify. I suppose the problems you had are file inclusions and path issues. You can fix it in AVR Studio, or try Eclipse + AVR plugin, which is simpler to use to me. Can you adaptive your codes for arduino ide. Hello, yes it is possible to port this to the Arduino framework for any ATmega328 based Arduino. If you do this please share your port.